A friendly farmer repaired my ripped open pants while having a Cusque�a beer sitting in my underwear. It was a nice sunny day. His wife was weaving in the traditional way derived from ancient Inca times (one part lashed around a tree and the other side around her hips). Eight bulls were having a nasty fight on the other side of the river. All people in the village were enjoying this spectacle. Public life was interrupted by the bullfights. One bull followed my earlier destiny and almost fell in the abyss, unfortunately no strong cow was there to help the bull out. When my pants were repaired and the margarita (1.1 litter of beer) was finished we continued. 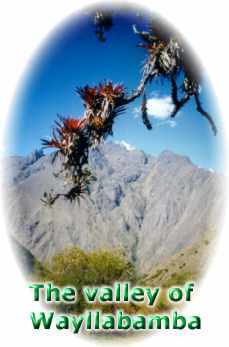 An eight years old girl helped us on the official Inca Trail and got her propina (tip). Now we had to continue without horses. Luckily we had the two chasquis who carried an amazing amount of luggage. 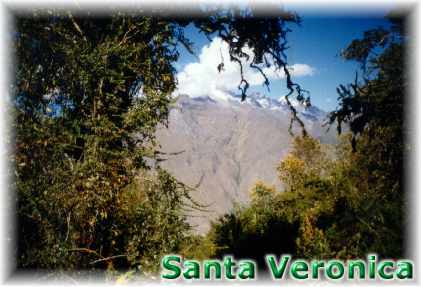 A long climb began through the valley of Llulluchapampa where the white summits of Santa Veronica are visible.